Businesses that generate no more than 27 gallons or 220 pounds or 2.2 pounds of extremely hazardous waste per month can participate in San Bernardino County's "Conditionally Exempt Small Quantity Generators" (CESQGs) program. 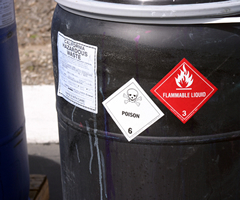 For a small fee, trained San Bernardino County Fire Department staff will assist small businesses with proper labeling and disposal of hazardous waste. Painters, auto shops, builders, and banks engaging in cleaning out foreclosed homes are just a few of the businesses that use this service. Small generators of hazardous waste often find it difficult to dispose of their limited amounts of hazardous. One reason is that many hazardous waste companies set a minimum amount of waste they'll pick up or charge a minimum fee for their services. This becomes an economic burden for businesses and can prompt some to improperly store hazardous waste, or worse, dispose of it illegally. The CESQG program helps protect the environment by providing these small hazardous waste producers with a low-cost disposal service. For more information, please visit San Bernardino County's Small Business Hazardous Waste or contact County Fire at 1-800-OILY-CAT(645-9228).